The stress, change and flood of emotions associated with unemployment are not limited to those who have lost their jobs. Often, families and significant others experience their own sense of turbulence when loved ones have been downsized. This reaction is common but sometimes problematic for job seekers in the midst of their transition, warns Lisa Caldas Kappesser, an emotional intelligence expert and author of "The Smart New Way to Get Hired: Use Emotional Intelligence and Land the Right Job." "Although family members and loved ones often mean well, they can be an obstacle during the job search. They want to support you, but their actions do not always turn out to be supportive," Kappesser explains. "For example, if Mom loses her job, a teenager's main concern may be that Mom won't have the money to buy her a prom dress. Such situations are difficult for both the family and the job seeker, all of whom are trying to cope with the changes in the financial situation and lifestyle." To cope with such situations, job seekers can utilize a broad set of emotional intelligence (EQ) skills, Kappesser says. In her book, she identifies other job search obstacles and explains how using EQ skills can help everyone cope more effectively. Below are examples from "The Smart New Way to Get Hired: Use Emotional Intelligence and Land the Right Job:"
Communication. Discuss with your family what your job search strategy is and what steps you have taken or plan to take in the near future. 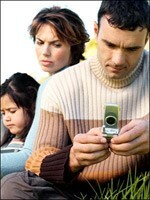 Communication is critical in families, particularly in times of stress and crisis when many people tend to withdraw. Empathy. Remember that job transitions affect the entire family. Everyone needs support and understanding. If you have children, listen to their concerns and keep in mind that most children are egocentric. Optimism. Be a role model for your family in how to deal with crisis and change. Your children will be in a job search someday and will remember how you handled it. They learn from your behavior, so it's best to model positive behavior. Cooperation, collaboration and teamwork. Let your family know you want to work together to tackle the challenges ahead. If you work together to find solutions to problems that arise, everyone will feel like they are managing the problem. Emotional self-control and stress management. Deal with your stress positively. Emotions are contagious. If you are feeling angry and acting out at home, everyone else in the family feels the tension and is prone to get angry or upset more quickly. Self-confidence. If you have confidence in yourself, your family and significant other will have more confidence that you can and will find another job. You need to think and act in terms of when you find your next job and not if you will find another job. Conflict management. Accept that there will be disagreements and work to resolve them. It takes less energy to deal with a conflict when it first arises than it does after months of letting it build up. Dealing with disagreements openly can help everyone move in a positive direction. Know that you might not agree at the end of your discussion. In fact, you may have to come to an agreement to disagree with each other at some point. Adaptability. During times of stress, it is normal to resort back to old, established and comfortable ways of doing things, but stressful times are often when new ideas and strategies need to be tried. Encourage each other to be flexible. *Excerpted from The Smart New Way to Get Hired: Use Emotional Intelligence and Land the Right Job by Lisa Caldas Kappesser. Selena Dehne is a career writer for JIST Publishing who shares the latest occupational, career and job search information available with job seekers and career changers. She is also the author of JIST's Job Search and Career Blog (http://jistjobsearchandcareer.blogspot.com/).